The Southern Marching Band performs the National Anthem for the flag raising at Home National Bank. American Legion Post 602 of Racine raises the American Flag during the Independence Day Parade in Racine. Tucker Hupp drives his truck down Elm Street along the parade route on Wednesday morning. 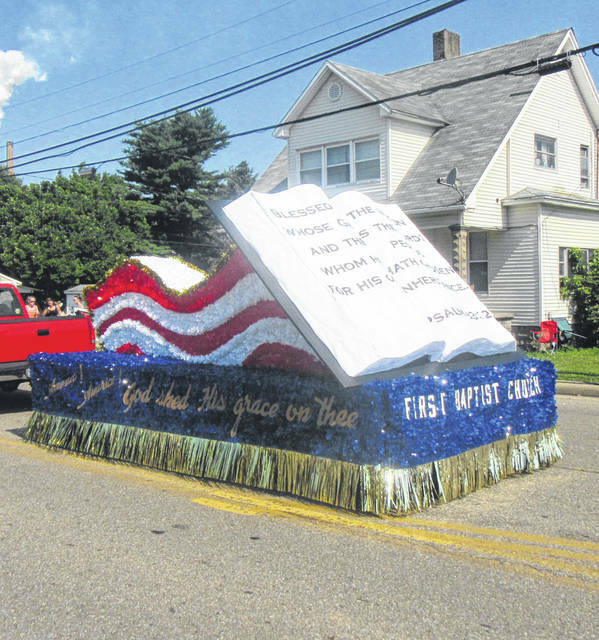 The float from the First Baptist Church showed the stripes of the American Flag and a Bible with the theme “America, America, God shed His grace on thee.” The float took first place in the RACO contest. RACINE — Despite the heat on Wednesday morning local residents lined the streets of Racine for the annual 4th of July Parade in the village. Fire trucks from several departments, as well as several tractors, bicycles, ATVs and other vehicles were part of the parade which made its way from Southern High School though the village. As is tradition, the parade made a stop at Home National Bank where American Legion Post 602 and the Southern Marching Band took part in the flag raising and the playing of the National Anthem. As the parade resumed, children in their red, white, and blue collected candy, popsicles and other items thrown by parade participants. Following the parade, many in the crowd made their way to the Racine Fire Station for the chicken BBQ and homemade ice cream. Later in the day was the return of Frog Jumping at Star Mill Park, with fireworks planned to cap off the evening. 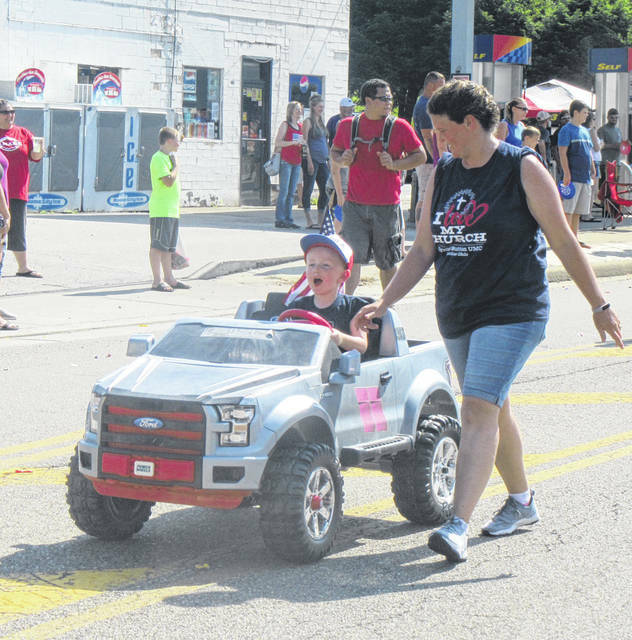 Additional photos from the Racine 4th of July Parade appear on Page 4 of today’s edition. Coverage of the Frog Jumping event will appear in the Friday edition of The Daily Sentinel. 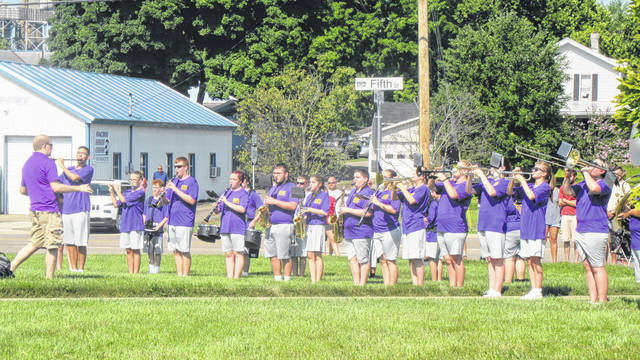 https://www.mydailysentinel.com/wp-content/uploads/sites/14/2018/07/web1_7.5-Racine-Parade-1.jpgThe Southern Marching Band performs the National Anthem for the flag raising at Home National Bank. 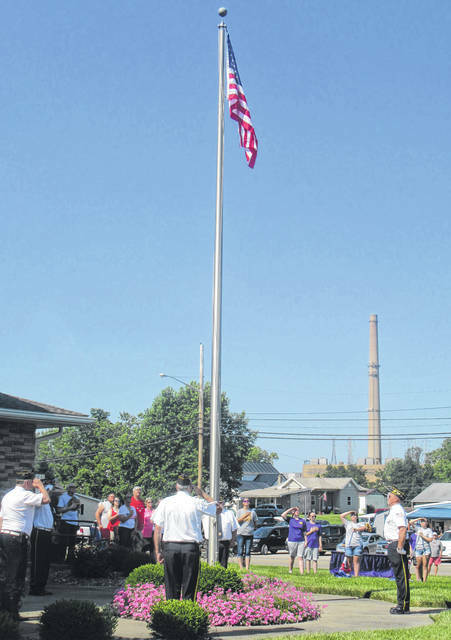 https://www.mydailysentinel.com/wp-content/uploads/sites/14/2018/07/web1_7.5-Racine-Parade-2.jpgAmerican Legion Post 602 of Racine raises the American Flag during the Independence Day Parade in Racine. https://www.mydailysentinel.com/wp-content/uploads/sites/14/2018/07/web1_7.5-Racine-Parade-3.jpgTucker Hupp drives his truck down Elm Street along the parade route on Wednesday morning. https://www.mydailysentinel.com/wp-content/uploads/sites/14/2018/07/web1_7.5-Racine-Parade-4.jpgThe float from the First Baptist Church showed the stripes of the American Flag and a Bible with the theme “America, America, God shed His grace on thee.” The float took first place in the RACO contest.